The trim and/or draft of the ship influences the hull resistance and therefore the fuel consumption. In general limited regard to optimal trim and draft is taken when loading the ship and therefore optimal conditions will most often not be achieved. By actively planning cargo loading, and thereby optimizing the trim and draft, one can save fuel and reduce the emissions accordingly. Trim and draft optimization is applicable for all vessel types and vessel ages. Some vessels have less flexibility regarding trim as, for example, cruise vessels which are designed for passenger comfort and facilities for the passengers. Further, full-body ships where resistance from viscous friction is higher than wave friction (e.g. 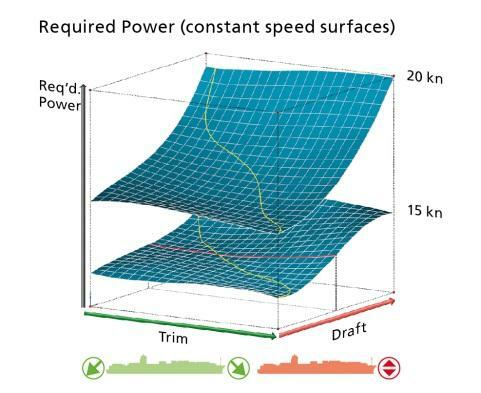 tank and bulk) will generally have a less reduction by optimizing the trim and draft and similarly for ships with limited ballast flexibility. 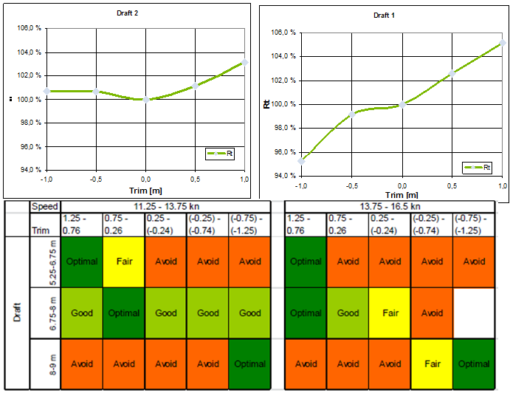 In order to be able to optimize the trim and draft additional equipment is required such as a better loading computer or a dedicated trim optimizer. In addition, the crew need training in the use of such equipment. Better trim and draft will reduce the resistance and therefore less engine power is required which leads to a lower fuel consumption. The installation of system and training of crew has been estimated at $15,000 to $75,000 (USD) per ship depending on type of system where easy trim systems are less expensive than complicated trim software. Once the equipment is installed, there is no additional operational cost. Optimizing the trim and draft has been estimated to reduce the fuel consumption by 0.5% to 3% on main engine fuel consumption for most ship types, although for ships which often trade in partial load conditions (e.g. container, ro-ro) the effect can be up to 5%. These numbers are based on full scale tests and detailed calculations performed on a number of different ships in different trades. *This Information Portal is still under development and further images will be added. For suggestions and additional technologies to be included in the Information Portal, please use the GloMEEP PCU Contact Form. This Energy Efficiency Technologies Information Portal was developed in cooperation with DNV GL.